Good Morning Britain’s Winter Warrior Bikes! 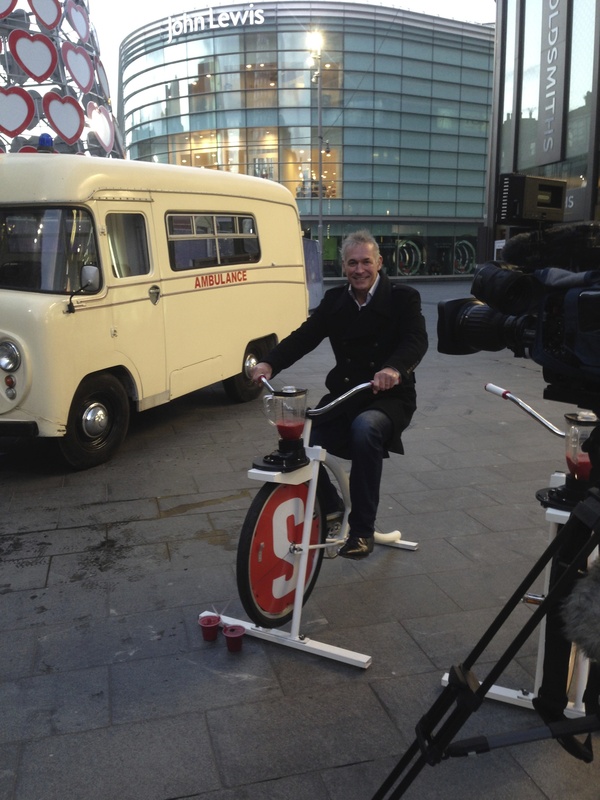 T’was a dark and cold November morn when 2 of our smoothie bikes could be heard clinking and clanking up the M6 to Liverpool to make their national TV debut and meet the nations favourite doctor! 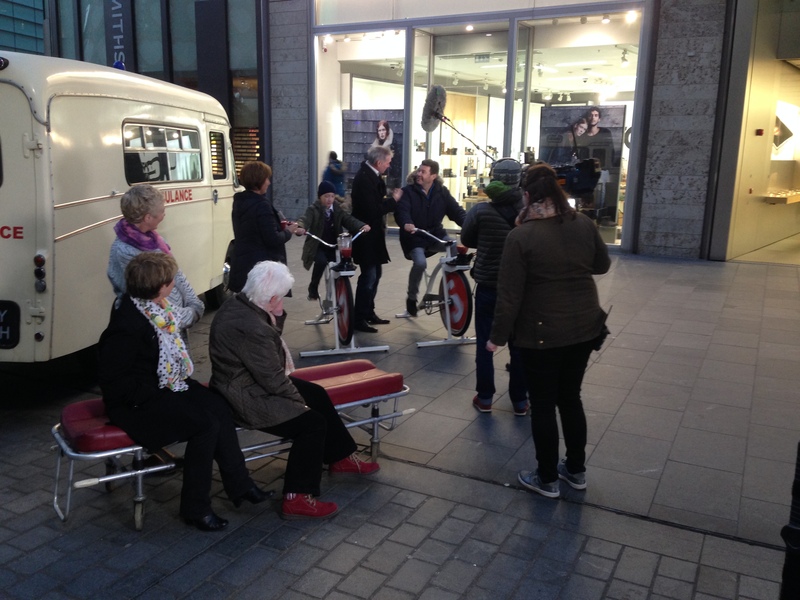 Good Morning Britain’s Dr Hilary and his vintage ambulance were on location at the Liverpool 1 shopping centre to meet some locals and talk about preventing the dreaded winter cold and flu that hits so many of us when the weather starts to really get chilly. One of the ways to try and safeguard against this is of course healthy eating, and what better way to consume your vitamins and minerals that are needed for a strong immune system than a delicious smoothie! 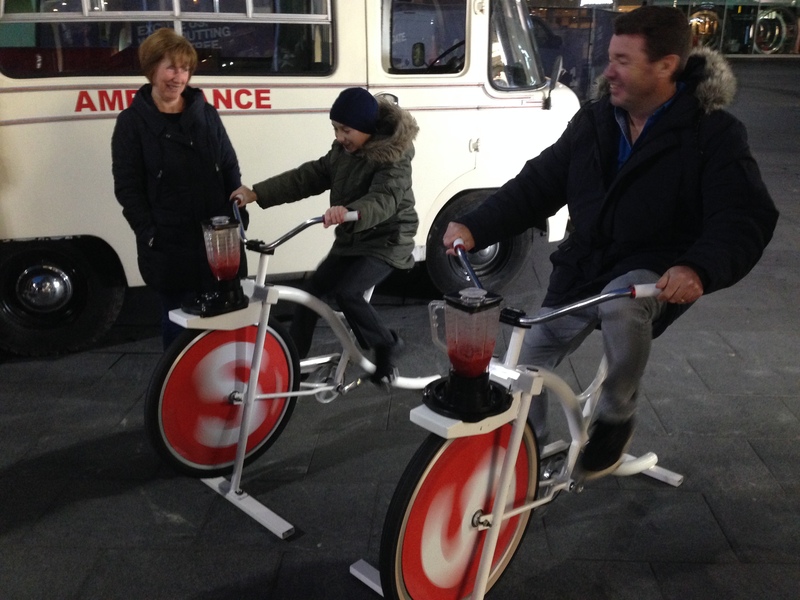 And to supercharge that already wonderful experience what healthier way could there be to blend the smoothies than by doing some exercise and using our blending bikes and pedal power! Barry and Oscar on Board! We had been contacted to provide the bikes and the smoothies for the filming and of course were delighted to be involved, we support anything that promotes health and wellbeing to the public and is really what Love Smoothie Bike are all about. It meant a very early start as we were on location at 6am with filming just after 7. Despite a couple of very nervous bikes and long deliberations about which colour handlebar grips to wear, we were on time and set up ready for the live broadcast. Pedal blending the vitamin C and antioxidant rich smoothies (the ones we used were Berry Go Round sachets by Love Taste – frozen strawberries, blackberries and raspberries blended with an apple juice base) were a local barber Barry (from Penny Lane no less) and his son Oscar, who was appearing on telly before heading off to school! Not a bad start to the day. The bikes kept Barry and Oscar warm and blended the fruit beautifully, the smoothies were delicious and the filming all went to plan (although I did fear for a pedestrian when Dr Hilary started up his ambulance and drove off into the distance while waving at us out of the window!). Cocktail Bike Arcade at your Xmas Party! With full insurance for alcoholic drinks to be pedal blended aboard our custom bikes you can add some competitive fun to your Christmas party and offer your guests Cocktail Bike Arcade! 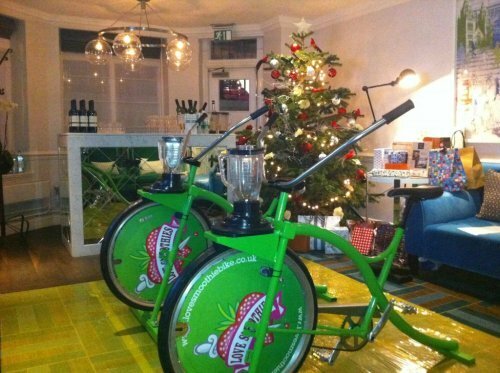 Like Smoothie Bike Arcade your guests will compete in a game of pedal skill to see who can be the closest to pedal blending the perfect drink. But as it is the party season we can offer the option of healthy refreshing non alcoholic smoothies as well as delicious fruity cocktails! Designated drivers and Yuletide revellers alike can all enjoy some light hearted fun and get into the spirit of Christmas! 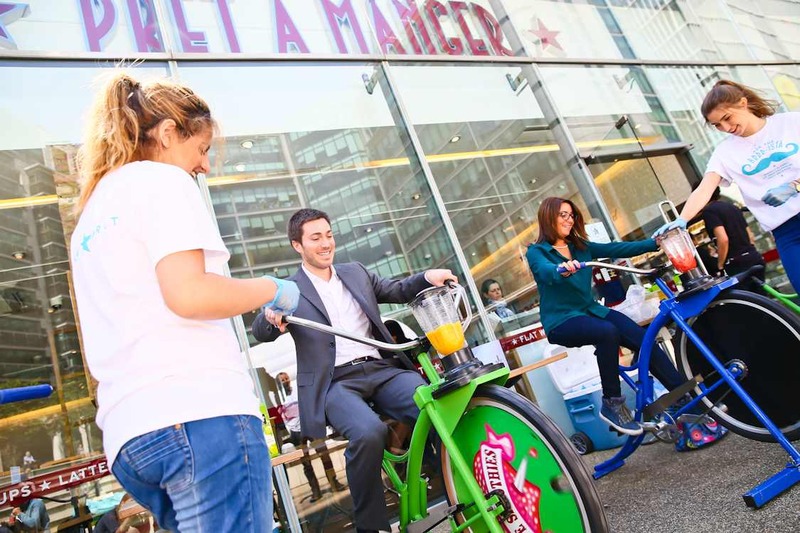 Pret A Manger and Stylist go Smoothie Biking! 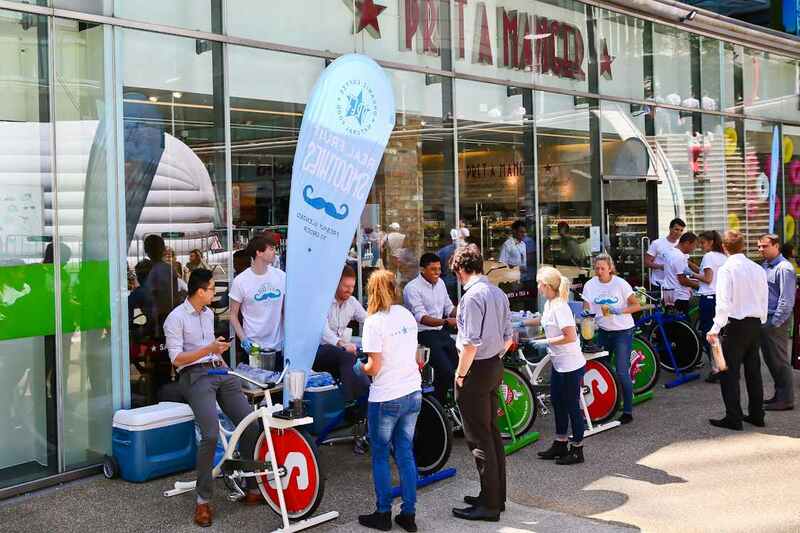 We were thrilled to team up with Pret A Manger in July as they ran a reclaim your lunchbreak campaign in partnership with Stylist magazine. The aim was to encourage female office workers in London to take a break from their desk at lunchtime, get outside and try something a little different and fun! Love Smoothie Bike supplied a fleet of bikes to events at Paddington Central and Regents Place, where over the lunch period lucky passers by (both female and male I might add) were given the opportunity to pedal blend their own delicious FREE Pret smoothie! Who could resist such an offer?! Not many as it turned out, the bikes were busy blending for hours and hundreds of smoothies were being slurped down in the sunshine. Happy, healthy workers were skipping back to their offices revitalised and recharged, ready to take on the afternoon. Does your workplace suffer from a post lunchtime lull? Why not have a smoothie bike arcade lunchtime session to wake the workforce up and energise them for the afternoon? !